How to put the Oculus Rift Cover on? Does the Oculus Rift Cover activate the proximity sensor? No. We've put a lot of focus into making sure that the proximity sensor will not trigger by accident. Is the Oculus Rift Cover machine-washable? Yes. Just use a sensitive/delicate program (low temp, low spin speed). What is the Oculus Rift Cover made of? It's made of cotton and sensitive drill. Both fabrics are 100% natural. How should I wash my Oculus Rift Cover/T-Shirt? Washing instructions are included in cardboard tag you received with your Cover/T-Shirt. For the mashine-wash, please use delicate materials programme (30°C = 86°F, spin cycle at 600rpms). The best choice is washing liquid for delicate fabrics or wool. Fabric softener is safe to use. Never use iron directly on the print! Please use a soft cloth for iron – that will help maintain the product longer. For the Rift Cover: NEVER use iron on it! Immediately after you have placed your order you will receive an order confirmation email. We're trying to response to your questions as soon as possible, if you didn't get any, please check your spam folder. The price is final? Does it include all fees (VAT)? Yes, there's no hidden costs. The price that you see in your checkout is final. How do I install my Prescription Lenses Adapter? Please make sure that your prescription is entered correctly before placing the order. If you are still not sure how to do it, please contact us. Can you do custom orders? My Rx values aren't avaliable in the drop down list. There's no PD value on my prescription. How can I measure my PD? The PD information is very important and it stands for pupillary distance. I've progressive/reading/distance Rx. Which prescription should I use? Only distance prescription is required for VR. There's no place for ADD value on your order page. What should I do? ADD (addition) value is not required for VR. Do you offer lenses with a blue light filter? Yes, We call it Blue Light Protection. In rare cases your prescription might require individual pricing. 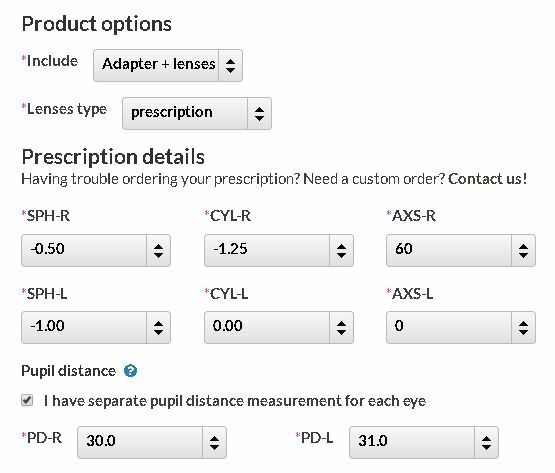 Enter your prescription on the order page to check if BLP is available. 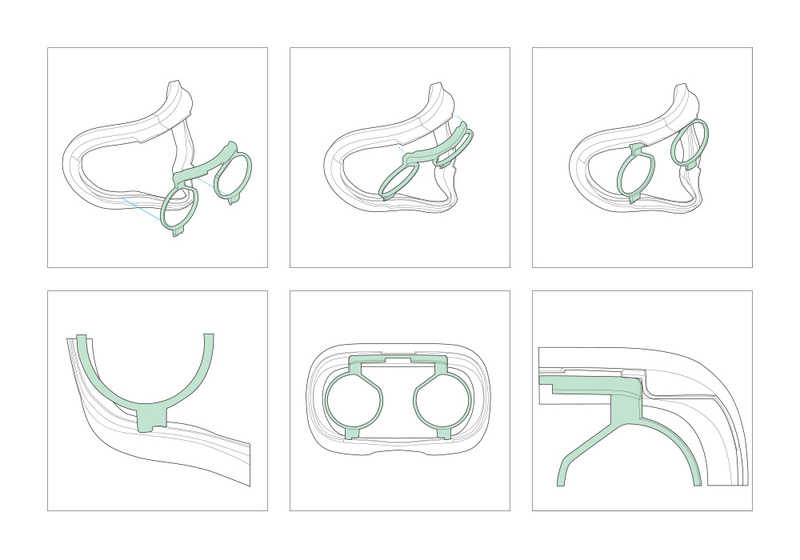 Do I need any special Rift facial interface (faceplate, Oculus Fit)? No. 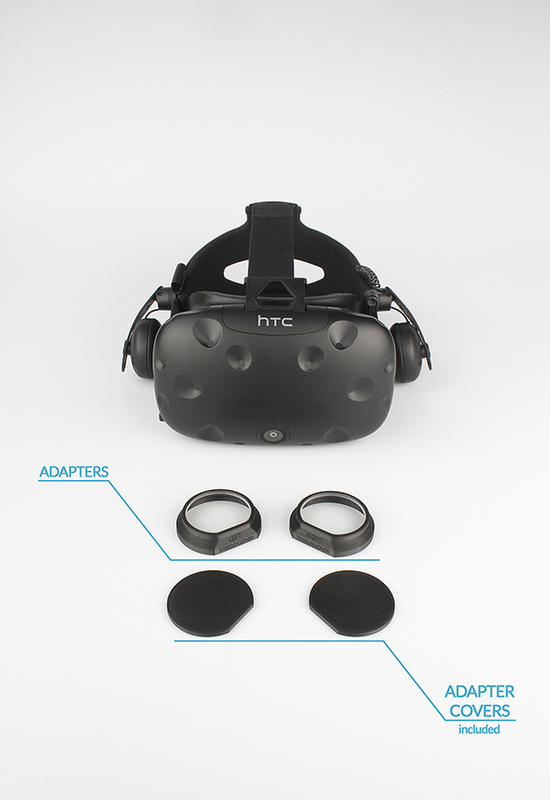 Our Rift Prescription Lenses Adapter is designed for original Oculus facial interface. You will receive everything that is needed to enjoy VR without wearing glasses. Our customer service team can fix your prescription as long as you reach out to us in a timely manner. Please make sure that your prescription is entered correctly before placing the order. If you are not sure how to do it, please contact us. How long does it take to manufacture my order? The term Plano refers to a lens with no vision correction (non prescription lenses). They can be used to protect your headset lenses and keep them dust free. Just put a slight pressure from the bottom of the faceplate.